There is still plenty of summer to be enjoyed so if you’ve been cooped up in the office, busy with life, or trapped in obligations then it’s time to take a break! Nantucket is the perfect place to find what you are looking for—whether a place for respite and relaxation or somewhere to explore and have fun. For those who love getting out on the water to fish, we have some wonderful charter boat fishing options for you to check out on your next vacation with us. Capt. 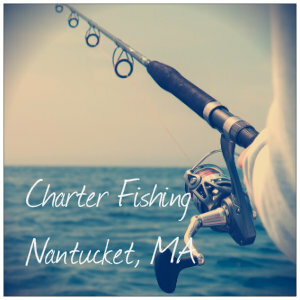 Tom’s Charters – Enjoy a day of fishing with accommodating, helpful and knowledgeable guides. Capt. Tom has been offering fishing trips since 1971 and has four boats that takes guests on a variety of trips. Choose from inshore, offshore, the flats, early morning, or nights. Bluefish, Striped Bass, Bonito, False Albacore, Tuna, and Shark are some of the species folks can catch around Nantucket. See pictures, video and get pricing information on their website. Topspin Fishing – You’ll have a great day out on the 32-foot Judge, with state of the art electronics and comfortable amenities for groups up to six people. Topspin offers three different trips—a 2.5-hour, 5 hour, or full day excursion. A full day out takes you a bit more offshore where you might see whales, pelagic bird species, and other ocean wildlife. Get all you need to know and contact info on their website. Albacore Charters – These wonderful folks have been a helping people fish in Nantucket for many many years. Generations have returned Nantucket to fish with Albacore and Capt. Bob Decosta, who started as a mate with his father on the boat when he was 9 years old. Bob brings an incredible amount of knowledge to help give you the best experience possible. Their 35-foot custom Sport Fisherman provides a comfortable ride and is fully equipped with the finest fishing equipment. Find more about their trips, pricing and contact information on their website. Don’t let the summer get away from you—book a memorable Nantucket vacation with us today! There is an abundance of things to see and do here or simply come to recharge your batteries. Book online today and contact us anytime for further information. This entry was posted in Summer, Things to Do by admin. Bookmark the permalink.